In glancing over the somewhat incoherent series of Memoirs with which I have endeavoured to illustrate a few of the mental peculiarities of my friend Mr. Sherlock Holmes, I have been struck by the difficulty which I have experienced in picking out examples which shall in every way answer my purpose. 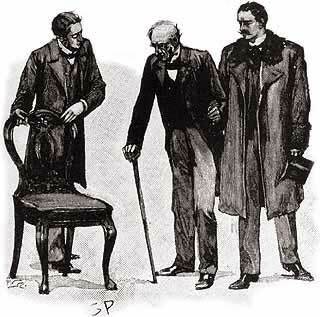 For in those cases in which Holmes has performed some tour de force of analytical reasoning, and has demonstrated the value of his peculiar methods of investigation, the facts themselves have often been so slight or so commonplace that I could not feel justified in laying them before the public. On the other hand, it has frequently happened that he has been concerned in some research where the facts have been of the most remarkable and dramatic character, but where the share which he has himself taken in determining their causes has been less pronounced than I, as his biographer, could wish. The small matter which I have chronicled under the heading of “A Study in Scarlet,” and that other later one connected with the loss of the Gloria Scott, may serve as examples of this Scylla and Charybdis which are forever threatening the historian. It may be that in the business of which I am now about to write the part which my friend played is not sufficiently accentuated; and yet the whole train of circumstances is so remarkable that I cannot bring myself to omit it entirely from this series. It had been a close, rainy day in October. Our blinds were half-drawn, and Holmes lay curled upon the sofa, reading and re-reading a letter which he had received by the morning post. For myself, my term of service in India had trained me to stand heat better than cold, and a thermometer of ninety was no hardship. But the paper was uninteresting. Parliament had risen. Everybody was out of town, and I yearned for the glades of the New Forest or the shingle of Southsea. A depleted bank account had caused me to postpone my holiday, and as to my companion, neither the country nor the sea presented the slightest attraction to him. He loved to lie in the very centre of five millions of people, with his filaments stretching out and running through them, responsive to every little rumour or suspicion of unsolved crime. Appreciation of nature found no place among his many gifts, and his only change was when he turned his mind from the evildoer of the town to track down his brother of the country. Finding that Holmes was too absorbed for conversation, I had tossed aside the barren paper, and, leaning back in my chair I fell into a brown study. Suddenly my companion’s voice broke in upon my thoughts. “Most preposterous!” I exclaimed, and then, suddenly realizing how he had echoed the inmost thought of my soul, I sat up in my chair and stared at him in blank amazement. “So far I could hardly have gone astray. But now your thoughts went back to Beecher, and you looked hard across as if you were studying the character in his features. Then your eyes ceased to pucker, but you continued to look across, and your face was thoughtful. You were recalling the incidents of Beecher’s career. I was well aware that you could not do this without thinking of the mission which he undertook on behalf of the North at the time of the Civil War, for I remember you expressing your passionate indignation at the way in which he was received by the more turbulent of our people. You felt so strongly about it that I knew you could not think of Beecher without thinking of that also. When a moment later I saw your eyes wander away from the picture, I suspected that your mind had now turned to the Civil War, and when I observed that your lips set, your eyes sparkled, and your hands clinched, I was positive that you were indeed thinking of the gallantry which was shown by both sides in that desperate struggle. But then, again, your face grew sadder; you shook your head. You were dwelling upon the sadness and horror and useless waste of life. Your hand stole towards your own old wound, and a smile quivered on your lips, which showed me that the ridiculous side of this method of settling international questions had forced itself upon your mind. At this point I agreed with you that it was preposterous, and was glad to find that all my deductions had been correct. I was weary of our little sitting-room and gladly acquiesced. For three hours we strolled about together, watching the everchanging kaleidoscope of life as it ebbs and flows through Fleet Street and the Strand. His characteristic talk, with its keen observance of detail and subtle power of inference, held me amused and enthralled. It was ten o’clock before we reached Baker Street again. A brougham was waiting at our door. I was sufficiently conversant with Holmes’s methods to be able to follow his reasoning, and to see that the nature and state of the various medical instruments in the wicker basket which hung in the lamp-light inside the brougham had given him the data for his swift deduction. The light in our window above showed that this late visit was indeed intended for us. With some curiosity as to what could have sent a brother medico to us at such an hour, I followed Holmes into our sanctum. A pale, taper-faced man with sandy whiskers rose up from a chair by the fire as we entered. His age may not have been more than three or four and thirty, but his haggard expression and unhealthy hue told of a life which had sapped his strength and robbed him of his youth. His manner was nervous and shy, like that of a sensitive gentleman, and the thin white hand which he laid on the mantelpiece as he rose was that of an artist rather than of a surgeon. His dress was quiet and sombre — a black frockcoat, dark trousers, and a touch of colour about his necktie. “Are you not the author of a monograph upon obscure nervous lesions?” I asked. His pale cheeks flushed with pleasure at hearing that his work was known to me. “One or two of them are so trivial,” said Dr. Trevelyan “that really I am almost ashamed to mention them. But the matter is so inexplicable, and the recent turn which it has taken is so elaborate, that I shall lay it all before you, and you shall judge what is essential and what is not. “I am compelled, to begin with, to say something of my own college career. I am a London University man, you know, and I am sure that you will not think that I am unduly singing my own praises if I say that my student career was considered by my professors to be a very promising one. After I had graduated I continued to devote myself to research, occupying a minor position in King’s College Hospital, and I was fortunate enough to excite considerable interest by my research into the pathology of catalepsy, and finally to win the Bruce Pinkerton prize and medal by the monograph on nervous lesions to which your friend has just alluded. I should not go too far if I were to say that there was a general impression at that time that a distinguished career lay before me. “But the one great stumbling-block lay in my want of capital. As you will readily understand, a specialist who aims high is compelled to start in one of a dozen streets in the Cavendish Square quarter, all of which entail enormous rents and furnishing expenses. Besides this preliminary outlay, he must be prepared to keep himself for some years, and to hire a presentable carriage and horse. To do this was quite beyond my power, and I could only hope that by economy I might in ten years’ time save enough to enable me to put up my plate. Suddenly, however, an unexpected incident opened up quite a new prospect to me. “This was a visit from a gentleman of the name of Blessington, who was a complete stranger to me. He came up into my room one morning, and plunged into business in an instant. ” ‘You are the same Percy Trevelyan who has had so distinguished a career and won a great prize lately?’ said he. “I could not help smiling at the abruptness of the question. ” ‘l trust that I have my share,’ I said. ” ‘Really, sir!’ I cried. “I stared at him in astonishment. ” ‘But why?’ I gasped.